A veteran of 40 years in the public schools of Florida, Alabama, and California, Joan Murray received her Master’s Degree in Performance from Louisiana State University. Her violin teachers included William de Pasquale and Jacob Krachmalnick. During 28 years at San Francisco’s Aptos Middle School, Ms. Murray coped with massive budget cuts by forming a non-profit fund, enabling this inner-city music program to be self-supporting. Ms. Murray’s 1984 California Mentor Teacher project, with its unique format of chamber music, individual instruction, theory, combined with an all-city orchestra has won national recognition. President H.W. 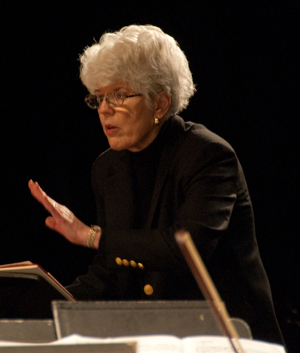 Bush named her a Distinguished Teacher (1990), and she received Chamber Music America’s Award of Excellence (1993). Upon retiring from the public schools in 1994, Ms. Murray joined the San Francisco Conservatory of Music faculty and she is an occasional contributor on the topic of youth music news for Robert Commanday’s web magazine, San Francisco Classical Voice. Ms. Murray won the prestigious 2014 Jefferson Award. Founded in 1972 by Jacqueline Kennedy Onassis, Senator Robert Taft, Jr. and Sam Beard, the Jefferson Award is America’s highest honor for public service, a “Nobel Prize for public service”.